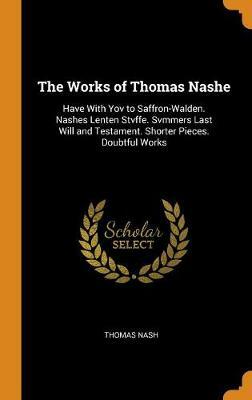 Thomas Nashe/Nash (1567-c. 1601) was an English Elizabethan pamphleteer, poet and satirist. He went up to St John's College, Cambridge as a sizar, gaining his bachelor's degree in 1586, then moved to London and started his literary career in earnest. The remaining decade of his life was dominated by two concerns: finding an adequate patron and participating in controversies, most famously with Gabriel and Richard Harvey. He arrived in London with his one exercise in euphuism, The Anatomy of Absurdity (1589). His first appearance in print was, however, his preface to Robert Greene's Menaphon. In the early 1590s he produced a pornographic poem, The Choice of Valentines, possibly for the private circle of Lord Strange. 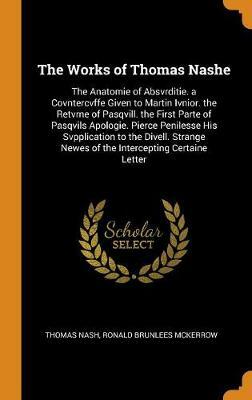 After Harvey mocked Greene's death in Four Letters, Nashe wrote Strange Newes of the Intercepting Certaine Letters (1593). Nashe attempted to apologize in the preface to Christ's Tears Over Jerusalem (1593), but the appearance of Pierce's Supererogation shortly after offended Nashe anew. He replied with Have With You to Saffron-Walden (1596). In 1597, following the suppression of The Isle of Dogs (co-written with Ben Jonson), Jonson was jailed, but Nashe was able to escape to the country. Buy The Unfortunate Traveller; Or, the Life of Jack Wilton (Dodo Press) by Thomas Nash from Australia's Online Independent Bookstore, Boomerang Books.